All of us here at SikhNet feel excited and proud to announce the launch of our first short original animation: KAUR. Available to audiences around the world free online, KAUR will make its debut on March 3, 2015, in honor of International Women’s Day. The purpose of the animation is to help inspire young Sikh girls, so they can know their heritage and understand the empowerment our Gurus gave to women. Reserve this date on your calendar and watch KAUR with the girls and boys in your life. We pray you will enjoy watching KAUR as much as we have enjoyed creating it. Do you know – projects like this only happen because of people like you? 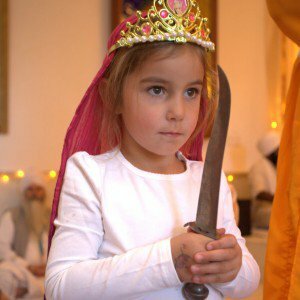 Four years ago, SikhNet.com founder Gurumustuk Singh wrote a blog post bemoaning the lack of powerful “princess” figures that his daughter could admire and imitate. Upon reading the blog post, some people donated toward this project, including an anonymous donor who made a sizeable contribution to SikhNet, providing seed money for the animation. It took us a few years to figure out the best way to use those gifts. The result is KAUR. To this day, we do not know who that anonymous donor is. But we thank you – whoever you are – and we hope you like the result. As SikhNet ends our major fundraising campaign for 2014-2015, we want to take a moment to thank all of you who gave this year so we can stay “on the air” for another 12 months. If you have not made a donation during our fundraiser, and if you would like to support the work we do, please consider donating by January 31st. Another donor has graciously offered a matching gift, so if you give in the next couple days, your donation will double. Your contributions to SikhNet allow us to provide unique services and inspirational media that support the world-wide Sikh community. And don’t forget to MARK YOUR CALENDARS. March 3, 2015. Join us in celebrating International Women’s Day, where we will remember the story of Mai Bhago and the gift of empowerment that the Gurus gave to all women, through SikhNet’s original short animation KAUR. Gano Haine, for generously sharing her time and expert advice. Pankaj Bhambri, for his hard work and dedication to this project. © 2015 All Rights Reserved. SikhNet Inc.